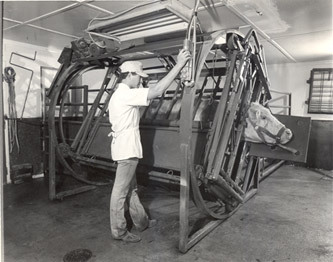 Shank’s Veterinary Equipment, Inc., originally Shank’s Machine Co., Inc., began manufacturing large animal surgery tables in 1957. 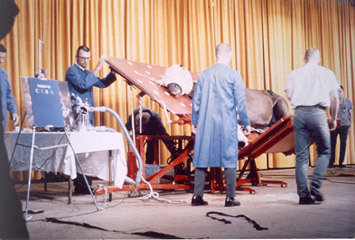 The company initially manufactured one simple table that could handle a partially sedated large animal and lay it from a standing position to its side. The Shank’s® Douglas Tiltmaster Table (commonly referred to as the Shank’s® Tilt Table) became the industry standard for the large animal veterinarian. 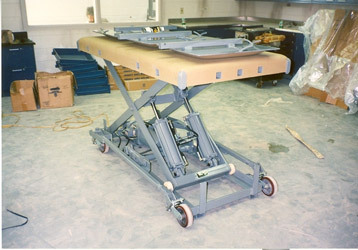 In 1978, to accommodate a changing veterinary industry, Shank’s introduced the Shank’s® Floor Model Surgery Table. It was smaller, more versatile and quite different than the Douglas Tiltmaster. Introduced in two different models, the concept for this table was based on scissor-type lifting, allowing for the safe and steady lifting of heavy loads. 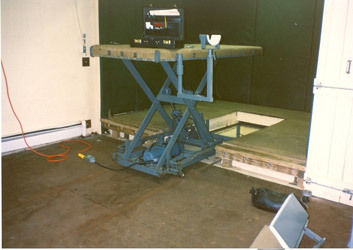 The Stationary Floor Model Surgery Table was designed to be incorporated into a recessed pit in the floor, allowing the practitioner to utilize the same room for induction, surgery and recovery. 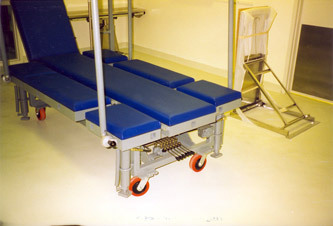 The completely mobile Portable Floor Model Surgery Table was one that could support a larger practice equipped with separate induction, surgery and recovery rooms. A variety of optional extremity supports were also introduced in response to the changing needs of the large animal surgeon. These accessories allowed for positioning of the animal in either dorsal or lateral recumbency , and also related to specific surgery procedures commonly performed. In 1988, Shank’s introduced the Shank’s® Dorsal/Lateral Equine Table. This table was designed specifically to meet the specialized needs of the equine veterinary practitioner. With the introduction of their one-of-a-kind, innovative multi-section table top surface, Shank’s set the standard for the industry. While other companies have attempted to replicate this “wing style” design, none have been successful and Shank’s continues to be unmatched in innovation. 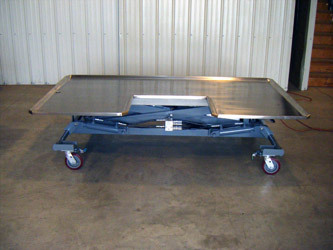 As the Company continued to grow and solidify itself as industry leader, Shank’s expanded into other areas of the large animal market, adding customized surgery tables, necropsy tables, stocks, and transfer carts to its product line. 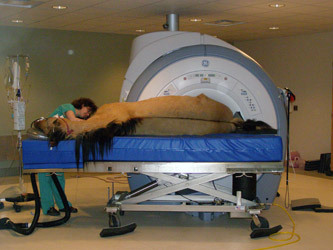 The most recent addition in 2004 was the Shank’s® Large Animal MRI Table. Using pneumatics as its lifting source, this non-magnetic MRI table is able to function and provide height adjustment within the magnetic field of the MRI machine, an accomplishment unique to Shank’s. 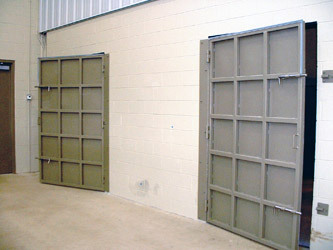 Recognizing an additional void in the large animal surgery market, Shank’s began manufacturing and actively marketing a line of heavy duty recovery stall doors, induction/crowding gates, deadbolt door locks and restraint rings. The Company looked to its long history of designing products to protect and support large animals, and based the design and function of these specialized fabricated metal goods on more than 50 years of experience in this specialized market. Shank’s product line does not end here, the company offers a variety of other surgery related items such as padded recovery hoods, lifting hobbles, foam table pads and much more. Today, Shank’s Veterinary Equipment, Inc. has a product line of 15 standard tables, and continues to adapt when needed to supply customized versions of these tables. The different table models are tailored to meet the needs of a variety of large animal veterinary practices. In addition, Shank’s continues to expand its clientele by partnering with a growing number of research, exotic animal and marine mammal facilities around the world. 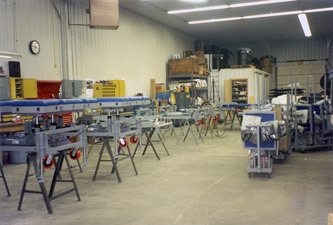 Shank’s has the unique ability to easily customize products during production, which sets it apart from its competitors. The Company has sold and/or installed equipment in over 30 countries and in over 145 U.S. and international universities and zoological facilities. In the past 54 years, Shank’s has continued to redefine the industry, developing one-of-a-kind products, expanding their global presence, and offering a variety of innovative and customized products for large animals around the world.